Flambé the chicken if necessary, wash the apples and cut each into 4 slices. 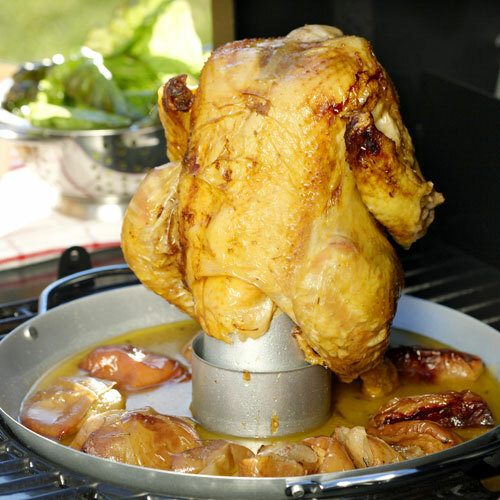 Preheat the barbecue grill to 240°C. Mix the chicken stock with water and set aside. Peel the onions and shallots and then cut them in half. Rub the chicken with lemon and then stuff the latter inside the carcass together with the herb bouquet, with a tablespoon of Guérande sea salt and 2 large pinches of pepper. Arrange the chicken on the base, with the apples and lumps of butter around it. Cook the chicken for 15 minutes and then drizzle with cider and chicken stock, repeat this while cooking (45 to 55 minutes). Ddrizzle the cider and chicken stock over the chicken several times during cooking with a small ladle to make a soft and crispy side.